Excuse my travel post being a day late…yesterday was one of those days where nothing worked – no internet, no 3G, nada. Anyway. More exciting things. Hands up who’s been to Central America? Anyone? Because, I think I might be going. Last week, when I booked my flights to Spain and France, I told a friend I know from work. Turned out he’d just booked flights for a holiday to, to Mexico City and then home from Panama. If my face could’ve turned green with envy, it would have done. But, instead of being jealous, I cheekily asked if I could tag along. There’s a saying that if you don’t ask, you don’t get, and in this case, I got. Turns out he’s more than happy for me to go with – it being a place neither one of us has been to before. And, on my part, I think I’d feel a bit safer. 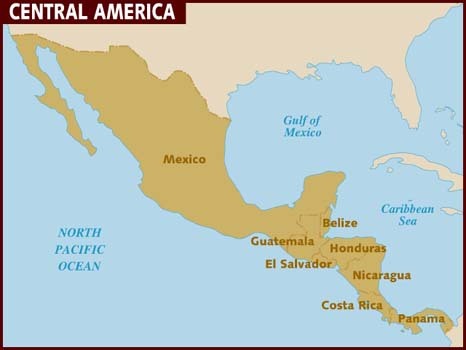 I’ve always wanted to go to Central and South America, but I’d never have the balls to go it alone. So. December 15th to January 15th, that is the plan. Mexico, Belize, Honduras, El Salvador, Costa Rica and Panama. Pretty tight scheduled, but it can be done. Alls we need to do is book the flights and be outta here! Love Costa Rica! We are planning to possibly move there in a couple of years. We are checking out Belize in February. Been to Nicaragua & Panama as well, but really fell in love with Punta Uva/Puerto Viejo regions in the Caribbean side of Costa Rica. Have a great time!! I’ve always wanted to go! Flights are so expensive though. How did you find Nicaragua and Panama? I enjoyed Nicaragua-we took a day tour from Costa Rica & got to see & experience quite a lot, and I’ve only been to Boca del Toro in Panama, which I really enjoyed. My husband & our neightbor just got back from Panama City and they didn’t like it at all there. The good thing is that you should be able to drive or taxi your way across the borders, although the border stops can take a long time.